UDM Downloads > Hidden Start! Console applications and batch scripts are regularly run at Windows startup and in schedule. The main inconvenience of this is that every application creates a new console window which flickers on the screen. 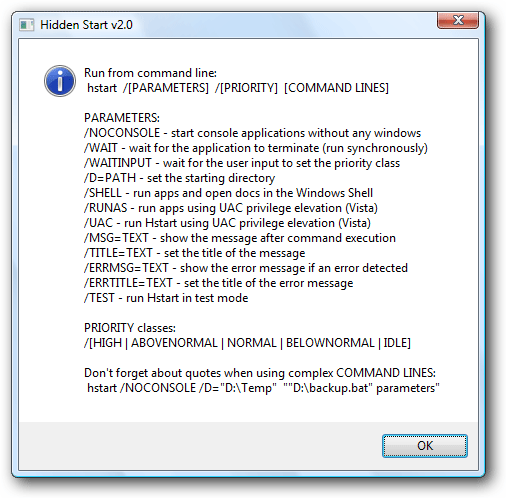 Hidden Start (or Hstart) is a small startup manager that allows console applications and batch files to be started without any windows in the background. Hstart is very small (~12 Kb), but it allows you to: - start multiple applications in the specified order synchronously; - start console applications without any windows in the background; - set the working directory and priority class of the created processes; - handle UAC privilege elevation under Windows Vista; - show simple messages after command execution.